If you own a car in New York City and need a place to park, leaving it on the street is a nice bargain. The only “cost” is alternate-side restrictions for street cleaning — otherwise, all that space is free. It’s such a good deal that in outer-borough neighborhoods, most car owners with an off-street space at home still choose to leave their cars at the curb. 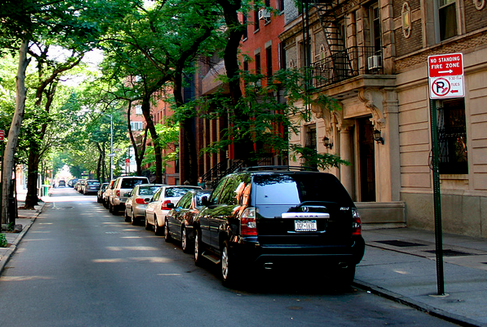 New York is one of the few large American cities without residential parking permits. While the city has not put any price on residential curbside parking, New Yorkers themselves are willing to pay, according to a new survey by researchers at NYU and CUNY. More than half of survey respondents who live outside the Manhattan core said they would be willing to pay for an on-street parking permit, if the city offered them. “Curb pricing is not a definite no,” Guo said. Many US cities have parking permits that restrict on-street parking to local residents in a neighborhood. As a result, non-residents are only allowed to park for a limited period of time (e.g. two hours) in these permit zones. If New York City offered your household an on-street parking permit for your neighborhood, how much would you be willing to pay for it? About 53 percent of respondents — who included car owners as well as car-free New Yorkers — said that if the city offered permits, they would be willing to pay, giving an average price of $408 per year. Factoring in the 47 percent who said they wouldn’t shell out any money for a permit, the average amount respondents said they would pay was $215. Responses in New York chart a middle ground between studies in other cities. In Belmont, California, a car-dependent suburb in Silicon Valley, residents said in 2004 that they would be willing to pay $40 a year for a residential permit [PDF]. Meanwhile, a 2010 study from Amsterdam, using a different methodology, calculated that residents there would be willing to pay approximately $12.80 a day — almost $4,000 a year — for an on-street parking permit [PDF]. In the United States, parking permits are most expensive in San Francisco, which has increased the annual price from $30 in 2006 to $109 today. But even that price is limited by state law to cover only the administrative cost of running the program, and doesn’t reflect actual demand. Guo and McDonnell’s study found some interesting variations in what New Yorkers are willing to pay for a parking permit. Car-free respondents weren’t any more or less likely to support charging for permits than car owners, though those who used transit at least six times in the seven days before taking the survey did support the idea more than average. Respondents already paying for off-street parking were more inclined to pay for a permit than those who currently use free off-street or curbside parking. Retired people and respondents with children are more likely than average to support parking permits, though they would pay less for a permit than those who are employed or without kids. Not surprisingly, higher-income respondents supported paying for permits at above-average rates. Respondents said they spend an average of nine minutes searching for an on-street parking space, and it takes an average of nearly four minutes to walk home from where they parked. Those who spent more time cruising for a space and walking home from where they parked were both more likely to support permits and willing to pay higher-than-average prices for them. In the survey, Guo and McDonnell did not specify how funds raised by permit sales would be used. They predict that returning the funds to the neighborhoods where they are collected would both increase support for the program and the price respondents are willing to pay for a permit. Guo and McDonald said they are interested in examining this question using a larger sample size in a future study. Its really shocking that New York isnt even doing this minor measure to put a very, very low price on street space. Theyre actually great for drivers when i lived in Sacramento because I could park at a metered spot in my own neighborhood without paying, and there were more often free metered spots than free spots. RPP would be a dream come true. It needs to be tied to registration of the car in NYS as the amount of vehicle insurance fraud that motorists get away with in this city via out of state registration is staggering. However, even $400 for a year is awfully cheap. I own a car and spend $200 a MONTH to park in an off-street lot, because dealing with alternate side tends to become the worst thing in your life when you own a car. Especially when you’d rather leave the car parked and bike to work. I would totally pay for a parking permit here in Williamsburg. It is bizarre that we don’t do this. When I lived in DC, I thought my resident permit was really great – it kept my street from being flooded with a bunch of suburbanite’s cars whenever an event or game was happening. Also, each permit came with a guest pass that was good for a couple of days, so our visitors weren’t inconvenienced either. I’m strongly in favor of RPP, but I would add the caveat that it needs to be more heavily targeted to transit-accessible neighborhoods. The problem is that you can end up disproportionately impacting poorer people in neighborhoods with poor transit options or somehow at least take into account the income level of those people – a flat annual fee is a heavily regressive tax. Transit-accessibility and income are not necessarily correlated. What about low-income people in Manhattan and high-income people in Queens? If you want to charge different amounts, you have to choose which to go by, demand (location) or income. Personally, I think it should be based on demand. As many Streetsblog readers know, driving user fees are generally not regressive IN AGGREGATE because lower income people don’t drive as much. I helped Prof Guo a little on this. Unfortunately, he didn’t take all of my advice on the wording of the main question. your neighborhood, how much would you be willing to pay for it? I think the results would have been very different. I’m sure that’s exactly how opponents of any RPP program will frame it. Having neighborhoods where the majority of residents do not own cars flooded by people parking their cars is a regressive tax. It causes congestion, pollution, and reserves public space for private use. With so many cars circling for parking, buses often get delayed, disproportionately impacting those who are least able to afford a car. Our current system is also a tax, of sorts, on law-abiding car owners who register their cars in state to their NYC address. Those people pay higher insurance premiums for being honest, premiums that are undoubtedly higher to make up for the under-insured New Yorkers who register their cars to Pennsylvania, North Carolina or even upstate. An RPP would probably free up tons of parking, making life easier for even poor people who must rely on a car for work or life in general. I completely agree, but am saying for those who really need it for work, the system needs to be designed in such a way that it doesn’t overburden those who can least afford the additional expense. I.e., if you’re already receiving benefits and can show that you need the car to get to your job, there should be some subsidizing off the cost based on income. I just want to avoid a situation where middle and upper income people who can afford the expense but don’t need cars are able to keep them but those who do need them and can’t afford it get screwed. See my reply to “Reader” in this thread. The problem isn’t the aggregate, it’s individual and how that impacts income inequality. There are ways to fix that as I describe in that rely, but that needs to be included in the plan. But why? If you really need to take the subway to get to work, is the city obligated to subsidize the cost? Poor people get screwed by high fares and long commutes, typically as the result of buses that are stuck in traffic. I get that we have to be sensitive to those who lack the financial means to cover certain costs, but I’d caution against giving too much stock to the idea that an RPP program disproportionately hurts the poor. That’s one of the reasons that congestion pricing met so much opposition, even though the stats about who drives didn’t back up the complaints. Actually, you can get assistance with subway fares. If someone can afford to own and operate a car, then they are not very poor. What you are saying is fair – so long as there’s an escape hatch for people who grew up in car-dependent areas but don’t want to be stuck driving to work to pay for the car they need to drive to work. I’m sure there are more than a few people people being priced out of their transit-accessible Crown Heights or Bed-Stuy rentals, then moving to Canarsie or East Flatbush and finding they want to buy a car. I (somewhat) happily pay $200 to Parks for a season tennis pass…I recognize that it’s a space-intensive sport with maintenance costs…a lot like parking! Tennis court time exhibits what economists call this “rivalrous” demand — others can’t play while I am..a lot like parking! Bring on the RPPs! Put a cap on the number issued (maybe 120% for a specific zone?) and conduct a dutch auction. There are very few cases of truly poor people in NYC actually needing a car. In fact, those who are truly poor who would really be hurt by a RPP fee of a few hundred dollars per month most likely couldn’t afford a car at all. Also, this being NYC, how many people in all income levels really need a car to get to work? Often those for whom public transit is extremely inconvenient for commuting are in that position because of conscious choices they made about where to live or work. Also, the vast majority by far of people who commute to work in NYC by auto don’t even live in NYC. RPP would be a regressive tax only on a very small number of city residents. What I would actually like to see instead of RPP is a gradual phaseout of ALL curbside parking, other than for delivery vehicles. Curbside parking in general encourages auto use, causes congestion, causes accidents, looks ugly, wastes space which could be put to better uses, and really serves no valid purpose in a city like New York which has many alternate ways to get around. The fact is people adapt. If you make auto use cheaper or more convenient, people drive. If you do the opposite, they find other ways to get around. You need to consider that auto use in general in a place like NYC causes huge problems for the majority who don’t drive. That’s really what it comes down to. I just don’t feel someone else’s convenience outweighs all the negatives caused by their auto use. If either residential or business auto parking is that important to someone, they should be willing to pay whatever it costs to provide off-street parking (and even that should have hard limits lest you end up looking like other cities which resemble giant parking lots). There are 3 to 4 MILLION intervals of valuable, public-owned curbside space currently being provided at NO CHARGE to owners of mechanized vehicles. How many hundreds of millions, if not BILLIONS of dollars is the city losing each year to this horrendous subsidy? It’s actually even worse than that. By providing free parking, you’re encouraging auto ownership and use with all the negatives that entails in a place like NYC. It’s not just the value of the parking spots which the city is losing here. It’s also having to pay police, firemen, hospitals, sanitation to deal with a whole host of negative externalities caused by the much higher rate of auto use which free curbside parking causes. I venture to guess if free curbside parking didn’t exist, overall traffic levels would be 10% to 20% of what they are now. The city would save big time on costs related to pollution, congestion, collisions, traffic controls, etc. If they want to be realistic, they should survey people with parking placards. Those are the only folks that matter. That’s hilarious! And, sadly, all too true. Coming up next… The survey asking people how much they are willing to pay in income tax. Free enterprise capitalism?? For car drivers?? This is the USA. The home of government socialism and subsidies for car drivers. The government owns shares of GM stock! Is this a one time auction for lifetime permits? an auction held every year for annual permits? do you have any security that if you can park one year, that you’d be able to the next? are existing residents privileged in anyway over future residents – are you ensuring opposition of any project to increase density out of fear that new residents will drive up the price of parking? Implementing this program and ensuring its success will be non-trivial. BTW, people occasionally play tennis for free without a permit, knowing they’ll have to vacate if someone with a permit shows up. The benefit in some neighborhoods is reducing the number of cars so that those with permits can reliably find a place to park. In many other parts of the city you are correct, the benefits would be negligible. A citywide system would be unlikely to find support. I see what you’re saying. But where do you draw the line? Some people commute by PLANE. Should we be subsidizing them? What if they say they “need” to fly? We should NEVER subsidize driving. Not charging the true costs IS a subsidy. Income redistribution is best done via progressive income taxes and benefits. After that, pay the costs. Good luck in the future reducing the number of parking spaces when there is a class of entitled permit-holders using them. Good luck getting people without cars to support a policy making it impossible for residents to park visiting relatives’ cars or rental cars on their streets. You already have an entitled class of non-permit holders using the street for free, so nothing changes there. Auction off permits good for one year only as well to reduce the sense of entitlement that could set in. Accommodations can be made for guest passes. Or the restrictions could be limited hours, or only apply to cars that have been there for a set number of hours. A city wide policy would be a mistake, a system catering to the individual needs of each neighborhood would be more appropriate. You are worried about the impact on poor people who need a car. Sure, they exist, but that’s a pretty small subgroup. Given all the other costs associated with car ownership, a few hundred dollars per year is unlikely to create a hardship for someone with the means to own and operate a car in the first place. I think the benefits are quite obvious. Less time spent looking for parking would be a huge benefit to most car owners. There are plenty of ways to deal with that, including guest passes, or converting some free curbside space to metered space, which is really just a very short term parking permit. I recall sitting in on a DOT presentation discussing residential permits, and the implementation involved having a two-hour period when only permit-holders could park on that particular block. Just like ASP, except that ASP bans all parking for that time period. I strongly disagree with you about the feeling of entitlement that permit-holders would have. If 1000 residents pay $10 each for 1000 permits to use 1000 parking spaces, and then DOT proposes to take 50 spaces away, then what are the residents paying for? You and I can assert that car-using residents should be grateful for just being allowed to have a car, but I think that’s a minority view. That’s not a big benefit if you don’t own a car, like the majority of New Yorkers. Perhaps it would be more palatable with a clear plan for what the fees would fund. My personal preference is for all parking spots to be muni-meter spots, vis-a-vis a complicated permit system that would cost money to administer. I got the idea from a visit to Amsterdam, but don’t tell @disqus_ggY8CnVn5H:disqus. If you don’t own a car, you probably don’t care much either way. What gets funded by the fees is just window dressing, as the total amount of revenue, after administrative expenses, is going to be very small. I have to respectfully disagree. There will always be at least one individual who is negatively impacted by a policy/project. A good policy creates a net gain for society as a whole. I’m pretty much giving up at this point – no one seems to be reading my posts. I never said I oppose the policy – in fact, I don’t even have a car and do wholeheartedly support such policies. I never had a problem with it in DC where I was there and occasionally had to get a temp pass for my then-boyfriend. I am merely saying that I worry about the economic impact on a very specific subset of people. If you have a permit that is good for one year only, and the next year you have to buy a new one in an auction, then coordinate the reduced number of parking spots with a reduced number of permits and the problem goes away. Those who want to park on the street would then have to buy a permit from someone who already had one, or find off street parking for the year. There are many ways to implement a parking permit program, the details the DOT mentioned in their presentation shouldn’t be taken as written in stone, and the details will likely have to vary from one neighborhood to another. Having a parking permit in NYC would be a dream… no more running down to the meter at 9am to add money in the machine or move the car. $400/year would be a steal! Much more affordable than $400/month parking garages cost! Add the $400/year parking to the $20/month for gas (thanks GadBuddy) and $30/month insurance (thanks Insurance Panda), and New York would actually be a cheap place to drive once again! Anyone else tired of “cost” only being determined monetarily? “Free” parking isn’t free. It costs time, money, and energy in the form of congestion, cancer, asthma, and contributes to traffic violence, which costs the city and tax payers 4.4 billion dollars a year, thanks to 70,000 accidents per year (not to mention 200 lives lost per year.) THIS IS ALL PREVENTABLE! See attached photo. Every week every car on the block is double parked in the bike lane, idling and polluting the block for an hour waiting for a street cleaner to come. What a waste of time, money, and air quality. And what a waste of space. Why do incentive people to store their private property in public space? Worse yet, only 3% of Manhattanites own a car, yet we devote 80% of public space to cars? Parking permits might help, so might smart parking, there are tons of solutions that will work. But there is a deeper shift in perspective that needs to happen. If we only measure things in terms of money, we will be truly lost. It’s time to live holistically. That doesn’t mean doing yoga, that means understanding the complex relationship between the whole and the parts.